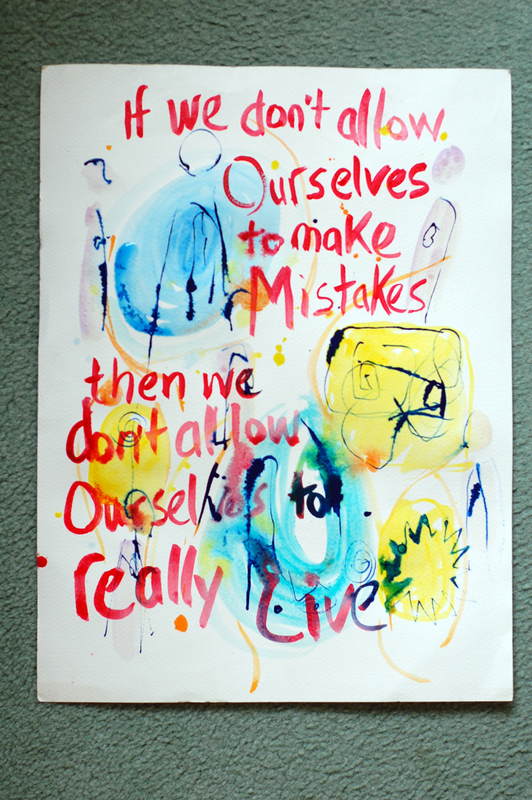 A painting I created last year to remind myself of the beauty of allowing mistakes to happen by taking a chance. Ok, so here goes. My first blog post on this site. My eyes are blurry and I am tired but also alive and well. I have been putting this post off for numerous reasons. Fear. and. Fear. yes. and. Fear. Yes, it’s clear. But here I am feeling the fear and doing it anyway. Thanks Susan Jeffers. I got this mantra from the Book. “The Life You Were Born To Live – A guide to finding your life purpose” by Dan Millman. A wonderful book that I refer to on many occasions to learn about my path in life and gain useful tools to find my way. When I finally allowed the mantra to sink in and truly feel in my bones, then it really changed my whole world from the inside out. I felt less pressure, I was more joyous and, in turn I could give more to the world. It is like magic.